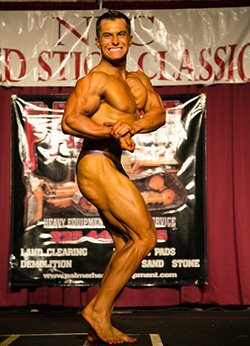 Amateur Bodybuilder Of The Week: Cut To The Bone! Ethan's body is a big block of muscle capable of handing serious horsepower. His plans build mass with exercises that combine bodybuilding and powerlifting! As a child, I was fascinated at the amount of weight my father could move. Seeing him make size and strength gains lit a fire in me that still burns to this day. I was athletic at a young age and continued through high school, but I wasn't the biggest guy. I was actually quite small. From seventh grade to my freshmen year in high school, I was 5-foot-4, 120 pounds, got picked on a tad, but never let it get to me. At age 12, my dad handed me The Arnold Schwarzenegger Encyclopedia of Modern Bodybuilding and I've been hooked since. I started working out immediately after, but really started hitting it hard my freshmen year in high school. My dad gave me my first protein shake and I gave it my all in the muggy (no A/C) weight room of Patterson High School. I gained 15 pounds in a summer and went from a shrimp to a monster. I strived to conquer goals in and out of the gym. I always want to get bigger and stronger. My friend and coach Brian Melancon is another reason I decided to bring it to the stage. He suggested that I should compete. I place 100 percent trust in Brian. His skills are the best and his will is unmatched. I knew he would get me where I wanted to be. I love setting goals and accomplishing them. The work never stops. When one goal is accomplished, another is immediately set and a course of action is put in place. I try and carry this into all aspects of life. It's not about doing what others can't. It's about doing what others won't. My workout regimen is the same in and out of contest prep. I rest as needed between sets to make sure I get full contractions and reach my rep range for each set. I created a type of power hypertrophy adaptive training split that works well. The idea of the protocol comes from Dr. Layne Norton. 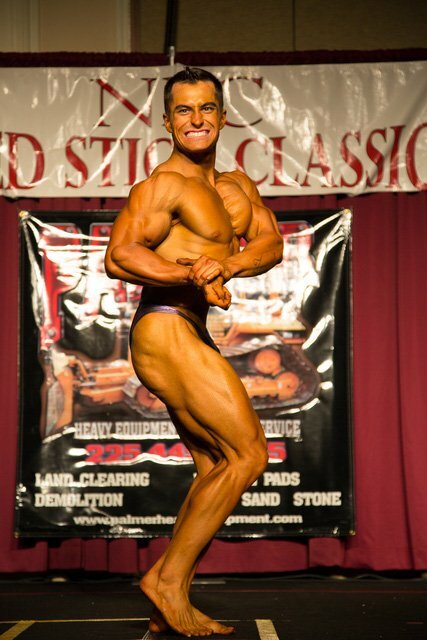 My passion for bodybuilding started when I realized you can obtain any look you want if you give it time. Rome wasn't built in a day and a bodybuilder can't be formed from one workout. I love seeing progression during a protocol. Turning aesthetic weaknesses into strengths and improving what you're already good at are tools for success. My dad worked out hard when I was growing up. Seeing him make gains and hearing him push through reps to get everything he could from his body motivated me to start working out. I saw that with consistency and dedication you can take your physical attributes to places previously impossible. I think of the goal in mind when I get a case of the "don't wants." It makes me realize what I have to do to get where I want to be. I also like to watch videos on YouTube to get pumped up. Seeing people who made it to the top do what they love gets me going. I was fortunate to qualify nationally this year. I plan to compete in the 2014 Team Universe Competition. My coach set a course of action for this show only days after this season has ended. From there, I hope to compete for Team USA and obtain my IFBB pro card. Then I want to obtain my IFPA pro card. I powerlift in the offseason and I'm a true believer that bodybuilding and powerlifting greatly complement each other. I plan to get a pro card in powerlifting. I have always had a dream to become a professional athlete and won't stop until I get there. Give your best every day, every rep, every second, and in everything you do. If you put all of your effort toward a goal, you will be amazed at what you can accomplish. Plan ahead and always have a course of action. Ronnie Coleman is my favorite bodybuilder. He was at the top of the sport when I was growing up. I still look up to him to this day because of his "shut up and lift" attitude. He was never concerned about the weight on the bar. He knew he could pick it up. I receive the best supplements at the best prices from Bodybuilding.com. I've shopped with the site for about three years and have been consistently impressed. 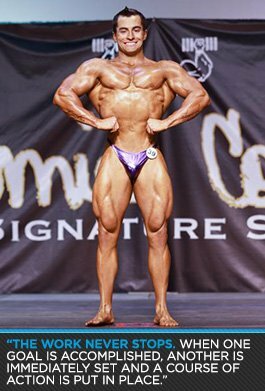 Their articles on contest prep have answered questions that others couldn't. I want to take this opportunity to thank people who helped me thus far in my bodybuilding career. I have an amazing support system, starting with my family. They are willing to do anything and everything to make my contest preparation as smooth as possible. They make every effort to be at my shows and I owe my success to them. My family allows me to be at my best through their encouragement and constant help. I'm the luckiest guy in the world because of the person I have the privilege to call my girlfriend. She's by my side through the entire process and is always there to assist me to cook food or steer the vehicle for car pushes at 9:30 p.m. Finally, I must thank my coach, Brian Melancon, CEO of C620 Nutrition. He talked me into doing a show and hiring him was the best decision I ever made. I trust Brian with my intended progressions and follow his detailed protocols with 100 percent effort. He's the best at what he does and his bountiful knowledge and ability to make somebody the best on stage goes incomparable.